Common perennial ryegrass germinates quickly and can be used as a temporary ground cover while the slower growing bluegrass plants take hold. In warm climates it is used as an overseed to maintain winter green in the lawn after the warm season grasses go dormant, however, it will not survive the summer heat. 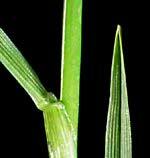 Of all turfgrasses used in the South, ryegrass probably has the highest maintenance requirement. Mowing, watering, fertilization and pest management needs of ryegrass are higher than for any southern turfgrass. Ryegrass has a rapid growth rate in the spring and requires twice weekly mowing at the taller heights - above 1"; mowing at 2 — 3 day intervals at heights around 1" and daily mowing at heights below 1". 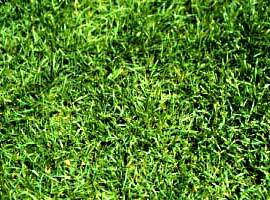 In warm climates, perennial ryegrass is used as a temporary "winter green" grass for overseeding established warm season grasses, especially zoysia and bermuda, in early fall. Planted in early fall, it maintains a bright green lawn through winter. By summer the perennial rye has died in the heat and the permanent grass is green again. To help perennial ryegrass seed planted into a warm-season lawn germinate well, mow the dormant warm-season grass just before you sow ryegrass, and gather up the clippings. Then rake over the area to score the soil's surface. Like all grass seeds, perennial ryegrass will not germinate unless the seed is in direct contact with moist soil after mowing, gradually fill them in with small amounts of soil, until they are raised to the level of the rest of the lawn. Mowing height: 1-1/2" - 2-1/2"